Former world junior record holder Yufei Zhang, of China, has been in the United States for the past fourteen weeks, and will stay there until the 2018 Asian Games begin in mid-August, she told SwimSwam Friday. She kicked off the 2018 Los Angeles Invite with a solid win in the 200 fly, going head-to-head with Katinka Hosszu. Zhang split 28.44/33.11/33.80/33.44 en route to her final time of 2:08.79. Hosszu split 29.53/32.85/33.80/33.09 for her second-place 2:09.27. Liyan Yu was third in 2:12.80. Zhang’s best time of 2:06.17 came in November 2017, and she sits at No. 2 in the world this year. Every month I’m looking at the weather forecast of Los Angeles just for fun. Most of the time it’s very simple. It’s sunny and hot. I wonder how long they haven’t seen the rain there. Yufei Zhang–wasn’t Liu Haitao her coach in China, the coach who was suspended for two years in connection with the doping of one of Yufei Zhang’s teammates, 16 year old Lin Zixuan, and he also coached Bingjie Li and Ai Yanhan up to a little while ago? Think they are also training in the U.S. You should have asked her about that. Really a shame that a coach like David Marsh would take in swimmers from programs such as that into his program. Lose a lot of respect for him. Isn’t it better to have them training in the US where they’re subject to the USADA testing regime than to have them training behind the curtain in China? I don’t think it’s fair to lose respect for any coach who coaches any swimmer who has ever tested positive. It’s one thing to lose respect for coaches who choose to coach dopers, but to hold athletes in a country like China, where elite athletes don’t necessarily have much choice in who their coach is, responsible for their coaches’ actions seems unfair. If you started tracing the web of Americans who have tested positive, and who their coaches are, and who else their coaches are connected to…it gets very ugly very quickly. You sure usada would be testing these Chinese visitors? They certainly would have the right to, especially if the Chinese swimmers are competing at American meets. Remember – USADA was the organization that tested both Nikita Lobintsev and Grigory Tarasevich positive for meldonium in 2016. Braden, who exactly constitutes the “web of Americans” in swimming who have tested positive, and the connected coaches? That is hardly a “web of Americans” in swimming who have been caught doping. I think the point you are missing is that top Team USA coaches who are paid to coach U.S. swimmers in international competition–with money contributed by U.S. charitable donors to the USOC and USA Swimming–are also presumably being paid on the side by foreign countries to coach foreign swimmers who come out of questionable programs and then compete (and perhaps cheat) against Team USA swimmers. That is a huge conflict of interest on the part of those coaches, and the practice should be stopped immediately. Is the point about the fact that her prior coach had other swimmers dope? Or that American coaches shouldn’t be coaching foreign athletes? The original comment was related to the former not the latter, and that’s what I’ve been responding to. If you don’t want American coaches coaching foreign swimmers, then I won’t argue your opinion on that. I didn’t miss that point, it just wasn’t a point made in the comment that I responded to. I agree with Braden Keith. 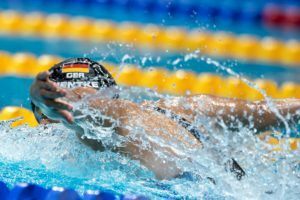 With US Nationals going on, and our own domestic pro swim series “tour” just wrapped up, I got curious about performances at last year’s international Fina World Cup tour (which the US swimmers seem to ignore). I see some Chinese women’s distance times that are on the heals of Ledecky. I’ll not be surprised if they come out of the woodwork at 2019 world champs or 2020 olympics and challenge (or beat!) her. I’d much rather those swimmers train in the sunlight with someone like Marsh than behind the red drug curtain.